The idea of Log Book Park, developed from artist Glenn Greensides' deep appreciation and concerns for our rich forest heritage here in British Columbia. People are always amazed with big trees and we know that they are becoming scarcer as time goes on. 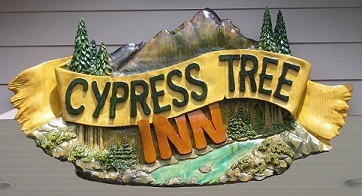 Glenn's latest concept is a way of preserving and enhancing the presence of these trees through his art. Glenn has created a collection of 14 Giant Wooden Books, which depict the history of our West Coast Forests. Each log was first cut in half and then stood on end to represent the cover of each opened book. Protective roofs representing the canopy of a tree were placed on top of the two half logs. 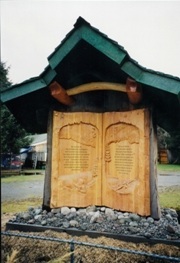 Carved wooden pages with relief images and words are attached to the logs creating the effect of a giant wooden book. Each of the 14 books represent a chapter in the history of our west coast forests. 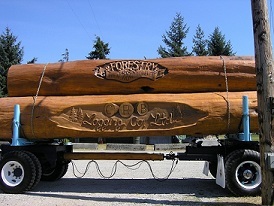 The story line for Log Book Park was written by the late Ken Drushka, the author of several books on British Columbia forestry. 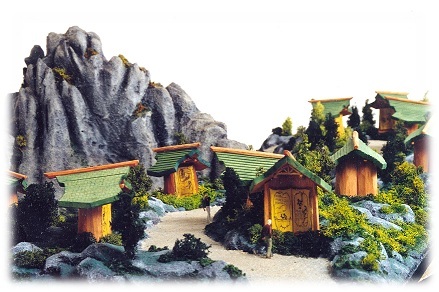 This collection is only Phase I of this exciting project that will develop into a "Forestry Theme Park" located in the west coast railway heritage park in Squamish, BC. Currently the collection awaits final installation - a work in progress. For more information on Glenn’s Log Book Park and other larger projects you can purchase his 15 minute DVD slide show for $10.00 or his 60 minute DVD documentary for $20.00.